The automated garage door openers have come a long way. These modern conveniences are designed for easy operation. They can be opened with the use of a remote control on your car, as well as by a button or a keypad from inside the house. Our technical teams at “Garage Door Repair Lockhart” are trained to provide full service. We can provide help in choosing the right door for you, as well as installing, maintaining and repairing doors as needed. We also support a wide range of makes and models from different manufacturers. This capability allows us the flexibility to provide any assistance for all types of door openers. Our experience in servicing doors enable us to finish a job as quickly as possible, cleanly, efficiently, whether it is a Liftmaster, Craftsman or a Sears door. A perfectly balanced door can be opened manually with hardly any effort. This is done with the use of torsion springs and cables. These springs are always under a lot of tension, more than enough to balance the weight of the door. When this balance is upset, it could mean that the door opener is damaged. Our experts are well versed at detecting different kinds of problems with door openers. It could be a defective spring, sprocket or another part that needs to replaced or lubricated. Either way, never leave anything to chance; always call Garage Door Repair Lockhart as your first and only line of defense. Openers sometimes jam or function erratically - there are instances when doors keep opening and closing or sometimes freeze halfway. This can be potentially dangerous if a person walks under the garage door, especially if you have children or pets. To have your door opener working like new again, always seek our professional help. We'll be at your place as soon as possible to work on your door opener problem. 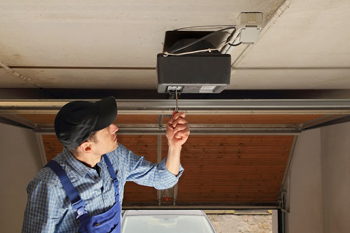 When it comes to garage door matters – be it repair or parts replacement – we are the ones to call. We offer top quality services with unparalleled efficiency.